The Miners' Library staff are able to help you get the most out of the library resources...please just ask! N.B. Limited loan books and reservations are not available to readers from outside Swansea University. Loan Periods - The normal loan period for books, periodicals (except the latest issue which is not borrowable) and audio-visual materials is four weeks, but if items are reserved by other readers, they will be recalled after one week. Limited Loans - Some books in heavy demand have been put on limited Loan and may be borrowed for one week only. 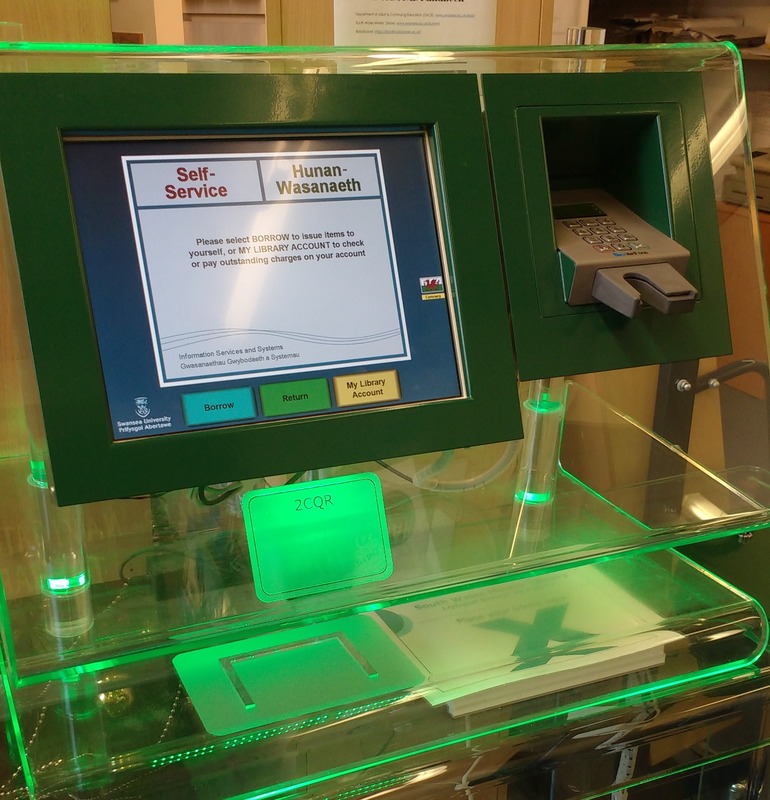 We have a self service machine in the issue desk area at the Miners' Library. You may borrow, return, renew or check your library account at this machine. There is a black and white printer in each of the IT rooms, the cost of printing is A4 B&W - 5p per copy. These printers do not do back-to-back. There are 3 scanners available to use in the library, as well as the photocopier. You may top-up your student/library card at the Issue desk. Please have your student card ready. If all copies of a book are out on loan, a request can be placed on iFind the library catalogue system, using your library card number. The book is then recalled from the current borrower and when it has been returned a notification to collect from the library is sent to you. You may pay your fines and fees at any library issue desk. You can pay through the self service machine (over £5) at the Singleton Park & Bay Library. By cheque please make payable to Swansea University. You can also pay by debit card over the telephone (not at SWML). As well as two dedicated computer rooms, there are several reading tables within the library. A large area for silent studying is situated in Room 3 on the groundfloor. Parking - Free parking is available in front of the Miners' library, in front of Hendrefoelan House as well as around the Emily Phipps building. Computing - We have two computer rooms with Open Access computers available for students and visitors. Printing and scanning is available in both computing suites. Printing currently costs 5p per A4 sheet, scanning is free of charge. The computer rooms are located on the groundfloor in Room 4 and upstairs in the loft area Room 16. Audio and Video - We have a range of cassette recorders, TVs, video & DVD players, microfiche & microreel readers, projectors and screens all for use within the library. Taking a break - A hot and cold drinks machine, snack machine and some tables and chairs are situated in the entrance area of the library for you to have a break. Toilets & Lockers - The gents, ladies & disabled toilets are situated in the entrance area, as well as lockers which you can use with a £5 refundable deposit. Floorplan - ground and first floor of the South Wales Miners' Library including fire exits. Items on loan from the library will automatically renew unless they are requested. Items will renew every month or week (for 1 week loans) unless a recall is placed on the item. There will be an email alert when items are automatically renewed to let you know the new date they are due back. Items which are less than a 1 day loan (ie short loan 6hrs.) are exempt and will not be automatically renewed. Thesis are exempt and will not be automatically renewed. External Borrowers are exempt from automatic renewals. Remember to request items you need. Automatic renewal of library books is great, but it does mean that if you need an item that is on loan to someone else you have to request it. If you don’t the loan could be extended. Requesting is simple and means that you should have to wait no longer than 7 days for the item that you need provided the customer returns the item on time.